France is a country that lately has become somewhat of a quality pool for those of us who cherish black metal at the avantgardistic frontier. Mention DEATHSPELL OMEGA , BLUT AUS NORD, PESTE NOIRE, or perhaps GLORIOR BELLI, and we all sigh with awe. And there seems to be more to come. 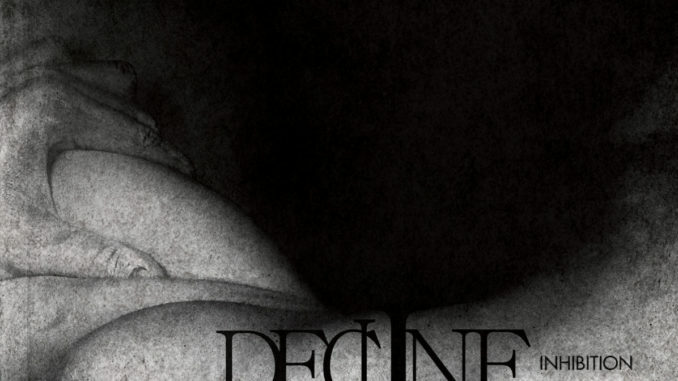 DECLINE OF THE I is a new project led by A.K. (VORKREIST, MERRIMACK, among others), and describes themselves as an alluring post-black metal mix of BURZUM, NEUROSIS, and CODE, inspired by the works of the biologist Henri Laborit, whose interests included psychotropic drugs, eutonology, and memory (according to the almighty Wikipedia). The album Inhibition is the first of a planned trilogy, and it starts off with the drowsy and stoic Où se trouve la mort? The song is spiced up with audio clips from what is perceived to be some old french movie/radio, and piano tones and gives a promising impression of what’s to come. The End of a Sub-Elitist Addiction adds some more power to the image, and there is a nice doom-section on just after 3 minutes, prior to a playful rhythmic part that reminds of dubstep, although with an organic heart-like pumping. The song is however over 10 minutes long, and although being well-played it becomes a bit too packed with garnish on the same chugging backbone. Art or Cancer begins in a more eerie state, and becomes quite interesting and playful after 2.5 minutes where the bombastic potential of the guitars, the choice of drumming style and some warp-like sounds join in. The guitars are overall switching between a gentle caress to something resembling a march of a legion of mammoths over your chest (in terms of music, that is a good thing). If there is a need for a new, secular funeral march, the first minute of The Other Rat could be a good candidate. The disharmonic combination of tunes in the initial riffs are a manifestation of sadness, but the song is changing throughout with the vocals amplifying the energetic, more angry parts. The much more different track Mother and Whore combines organic and inorganic parts, and uses the vocals of an upset woman talking about something that only those speaking french will understand. However, after 4 minutes the song is repeating itself over the same chord combination with small variations here and there, and this becomes a bit tedious. Static involution surprises with a DIMMU BORGIR-like arrangement of bombastic riffs and choruses in its beginning, but also make use of the unconventional combination of tribe-like rhythms and twisted carnival-sounds. There is a slight overdose of breakdowns now and then, and the tedious repletion of a typical melody becomes obvious here as well. The bass gets highlighted in L’indécision d’être, which is adds a contradictory coziness to the music alongside the bending guitar. The final song, Keeping the structure, is a bit minimalistic in its arrangement compared to the previous tracks, but has a nice flow throughout. Inhibition is overall a nice, creative, and well-made debut. It may not be perfect, but its eagerness to explore and create different makes DECLINE OF THE I a welcomed addition to which acts one should keep an eye on for future releases. 01 – Où Se Trouve La Mort?